Don't deal with the hassle of trying to fill out your tax returns by yourself when you can rely on our Registered Tax Return Preparers to do it for you. Count on our experience and knowledge to get you through a stress-free tax season. Instead of sitting at a desk looking through paperwork and trying to figure out confusing IRS instructions, get help from our certified tax preparer who easily finds the most tax discounts and credits possible so you can owe less or maybe even get more money back. As a federally authorized tax return preparation company, we are here to help clients located throughout St. Louis and the surrounding areas feel more confident about filing their taxes. Not only do we meet all of the federal licensure requirements for this task, but our professional team also ensures that all of the information is provided correctly so you don't have any issues with the IRS later. A registered tax return preparer is federally authorized to accept payment for the preparation of tax returns. By the beginning of 2014, only registered tax return preparers, Certified Public Accountants, attorneys, and enrolled agents were considered legally qualified to prepare tax returns professionally. That means that you are going to need a certified tax preparer by your side to ensure that all of your tax information is properly submitted. The professional role of a registered tax return preparer was vouchsafed by the Internal Revenue Service in order to create more uniform standards via its "Return Preparer Initiative." This initiative is notable for compelling all tax return preparers to register with the IRS, to obtain a valid Preparer Tax Identification Number, and to meet other relevant IRS requirements. The ultimate goal of this initiative was meant to protect unknowing consumers from having their tax returns sabotaged by imcompetent tax return prepation. Property filling out your tax forms and filing them with the IRS is a must to avoid audits and other potential issues, which is why it is so important to work with a professional like our certified tax preparer each and every year. What Does Our Tax Return Preparation Team Do? The team of Registered Tax Return Preparers on our staff is legally authorized to prepare federal tax returns for any individual that comes to us. 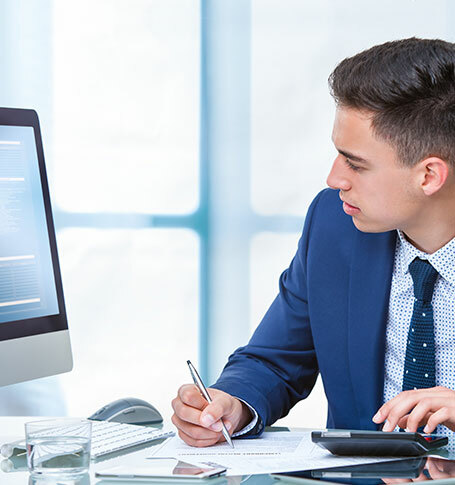 Our team is also capable of representing our clients in front of agents of the Internal Revenue Service, including during audits, so that they have the best assistance and representation possible. At our tax return prepation company, we have experience dealing with IRS representatives of all types, including the Taxpayer Advocate Service. We know the protocols used as well as many of the agents themselves. This allows you to quickly find positive resolutions for any issues you might have with past tax returns, so you no longer have to be concerned about the IRS demanding future actions from you. Those who are in need of a seasoned Registered Tax Return Preparer can turn to our team to represent their interests as necessary. Our experience has taught us well, and we look forward to putting our knowledge to good use for you. If you aren't working with a certified tax preparer, then you aren't getting the best possible results from your tax returns. Only a professional, fluid in the language and requests of your tax return forms, is capable of finding all of the itemized deductions, tax credits, and other tax savings you might be qualified to list on your return. We help you avoid paying more money then you owe while ensuring that everything is filled out correctly so that you don't have to worry about any mistakes on your forms. Make tax season a good one for you and your family by working with our Registered Tax Return Preparers. Contact our registered tax return preparers when you need professional assistance on your tax returns. Our specialists assist clients located in St. Louis, St. Charles, St. Peters, O'Fallon, Wentzville, MO, as well as the surrounding areas.